By Lyns on February 12th, 2009 . Filed under: . Julie Pettitt is a ceramist working from her studio in Essex, England. She works with porcelain slip which she colours with her personally developed soft pastel shades of blue, yellow, green, pale pink and dark pink. These totally scrummy ceramic cupcakes created by Julie are just perfect for keeping your favorite treasures inside. 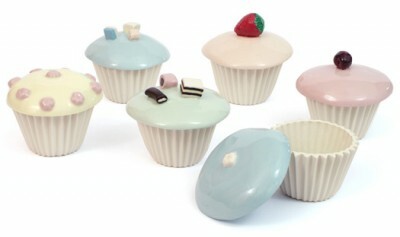 They make an ideal present for almost any occasion; birthdays, wedding favours or just as a treat to a special someone. They measure approximately 11cm across and 10cm high and are adorned with a glossy cherry. If cherries aren’t your thing why not try some liquorice allsorts, a strawberry or some Dolly mixtures? Or if like me you can’t decide, collect them all. Yum! Available in selection of five different lid colours. * Height: 100mm. Depth: 110mm.